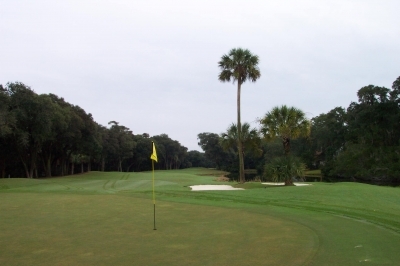 KIAWAH ISLAND, SC � Everybody�s done it � something in life that you knew was a mistake at the time, yet did it anyway, and regretted it for years. If only we could relive the past, plaster over the blunder, and re-write history � it�d be life�s grandest mulligan. Cougar Point's par three 2nd hole is the first you'll see when you enter the resort -- and it's not a bad view, either. 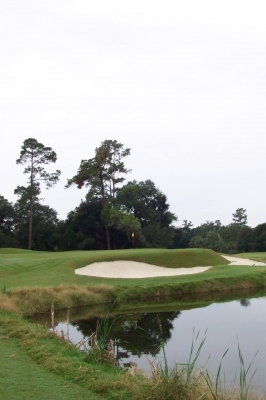 In the case of Kiawah Island Golf Resort�s Cougar Point Golf Course, there was such a �second chance,� and its golf architect, Gary Player, ran with it. The dogleg right, par four 17th hole (363 yards) features a huge oak to the right of the short landing area. Big hitters can try to blast it over the tree, or draw it around it if you dare. It wasn�t really Player�s fault, either, since the original ownership group changed the parameters of the course during construction, including how much land was available for golf. Marsh Point was everything that Gary Player didn�t want in a course, one that looks easy but played difficult. Player�s one of history�s legendary golfers, having mastered his craft and won all four major championships on some of golf�s most difficult courses � but when it comes to designing for the average player, he wants his layouts to be fun. 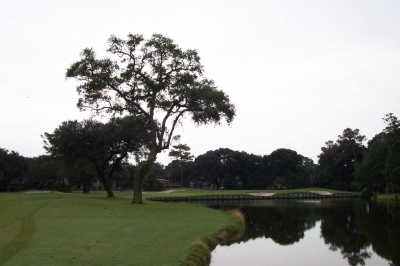 A tree to the left of the tee box on the par five 9th hole -- and a pond to the right of the landing area -- strongly discourages a fade for your ball flight. 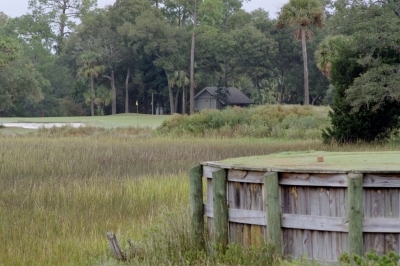 It bugged him to the point where, when the new ownership at Kiawah Island Resort contacted him in 1995 to gauge his interest in redesigning Marsh Point, he gladly did it for free. How�s that for anxiously accepting an offered mulligan? The 443-yard, par four 10th hole is Cougar Point's #2 handicap hole -- and you can see by the green, you're going to pay dearly if you fail to hit the target. 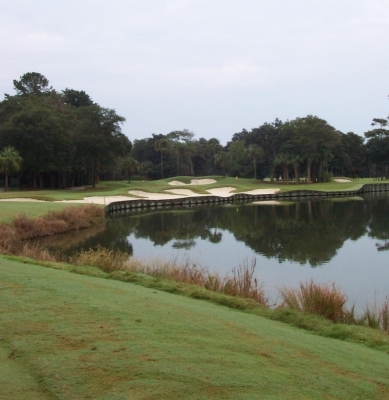 Because of the obvious playability issues, the number of rounds on Marsh Point declined in comparison to Kiawah�s other courses, Turtle Point, Osprey Point and the Ocean Course � all of which saw steady increases over the same time period. 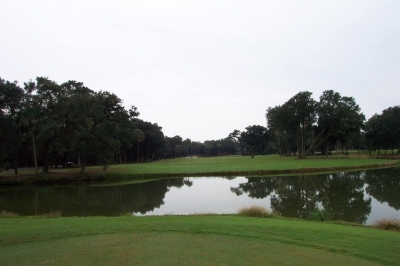 Marsh Point became the course you�d play only if the tee sheets at the others were completely full. Bill Goodwin bought the resort in 1993, and decided that the situation on the ugly duckling golf course couldn�t remain � that�s when he contacted a very enthusiastic Gary Player about coming back to do the work. The result of the collaboration was a brand new golf course, with only the routing remaining the same � that couldn�t be changed, because the residential neighborhood surrounding the layout was already fully developed. It's only a mild carry from the back sets of tees on the 18th hole, but you'll still be glad when you're over it. To basically �blow-up� the old course, Marsh Point was shut down just after Thanksgiving in 1995, and it re-opened as Cougar Point the following September. Everyone involved agreed that the �new� course needed a new name, the �Marsh Point� moniker carrying too many negative associations with it. A contest was held, inviting interested people to submit new possibilities. Ferguson said they chose �Cougar� because it continued the naming scheme of animals that are (or were, in the case of cougars) indigenous to the island, and because a lot of folks had suggested that name. That�s not to say the entire baby was thrown out with the bathwater. Though the �new� Cougar Point looked and felt new, it retained much of what was good before, namely the variety built into the original routing. Looking towards the tee box on the par three 6th hole. There's a lot of marsh between you and the green -- and probably a few thousand golf balls as well. The course�s low-profile reminded us of some layouts we�ve seen on or around Hilton Head Island � and the same thing can be said of the relative closeness of the houses on the fairways, probably Cougar Point�s biggest drawback. But another aspect helped distinguish it from its resort siblings and other low-country courses in the region: its flashy bunkering. From behind the flagstick of the par three 12th hole -- the houses aren't far away from you, but this view proves you can still find quiet solitude at Cougar Point. It�s a way of making the course look hard but play easy, which was more in line with the real Gary Player design philosophy. There were other things done during the renovation to make the course seem �bigger� than its somewhat narrow corridors would allow. Another concern of the designers was the ample live oaks that the land had grown over the years, which contributed much of the cramped feeling of the layout. The property�s covenants protected the trees, so they had to find a way to work with or around them. Two large oak trees dictate your options on the par five 15th hole. You'll need to push your second shot past them if you're to have a clear view of the green. �Those oaks were so big that it took some extra consideration on some holes to see how they�d fit into the overall framework that we were trying to accomplish � because they�re protected, and also because we didn�t want to touch them anyway. They add a lot of character to the course, give it a mature look, and are very beautiful,� Freeland added. One other note before looking at a few of the highlight holes � for you movie buffs, you might recognize Cougar Point as the �set� for several scenes in �The Legend of Bagger Vance.� The starter filled us in on that � particularly the scene at the beginning where Jack Lemmon has his heart attack � that�s the 11th hole at Cougar Point. You�ll certainly see it in the �flashy� bunkering. 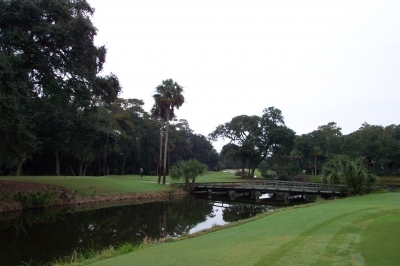 Highlights at Cougar Point include a stretch of holes midway through the outward nine, four, five and six, which play alongside the Kiawah River. 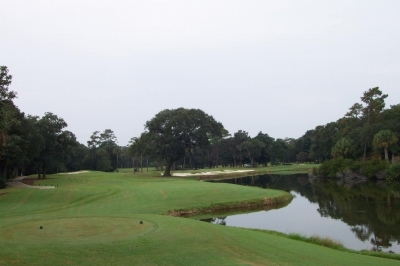 For a layout that begins in the heart of the resort and surrounding community, these holes present a completely different flavor, with long-range vista views of endless marsh. The par five 3rd hole is a great risk-reward hole. Four and five are parallel long par fours playing in opposite directions � both either toughened or eased by the direction of the wind blowing off the marsh. Six is a very intimidating par three from the back sets of tees, as the green looks a lot farther away than its 180-yard length would indicate. As usual, once you�ve landed safely you�ll realize there was a lot of room out there all along. The eighteenth hole is a nice finishing hole, a challenging 415-yarder with a very memorable green � there�s a large bowl in the center. Needless to say, if the pin�s tucked down there and you can manage to roll it into the bowl, you could have a very nice birdie putt to close out the round. 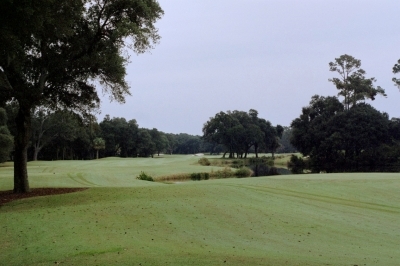 With tees and greens close to each other and a beautiful low-country landscape, Cougar Point is a walking player's delight. 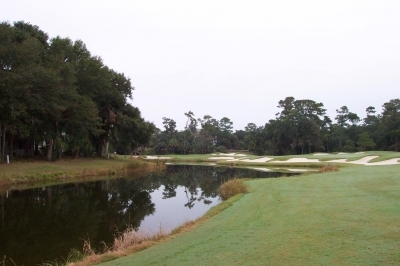 Despite its considerable attributes, Ferguson says Cougar Point still doesn�t receive the play that the other Kiawah Resort courses get (in fairness, Cougar�s clubhouse isn�t in the same league as Osprey�s or Turtle�s) � but its reputation is gaining fast. Most people�s reactions are very positive, as were ours. Cougar plays easier than the other courses, and its compact nature makes it a very walk-able, enjoyable course. It�s one �mulligan� that turned out much better than the original shot. But don�t take that as a sign that yours will find the same kind of success. And besides, for you and me, it�s cheating. Enjoy your choice of accommodations � in a luxurious oceanview guest room at The Sanctuary or in a one-bedroom scenic villa � plus one round on the world-renowned Ocean Course and two rounds at any of the resort�s other championship courses. Green fees, cart fees, range balls, daily breakfast and dinner at any resort restaurant are also included. Enjoy your choice of accommodations � in a luxurious oceanview guest room at The Sanctuary or in a one-bedroom scenic villa � and one golf round per night's stay at any of the following four championship golf courses: Osprey Point,Turtle Point, Cougar Point and Oak Point. Green fees, cart fees, range balls and daily breakfast are also included. For additional information or to make reservations, call or click: 800.654.2924 � www.kiawahresort.com. For groups of 12 or more, call our group golf specialist: 800.576.1585.